Even vintage computer game geeks need home design – and what could be more appropriate than the Asteroids vase. 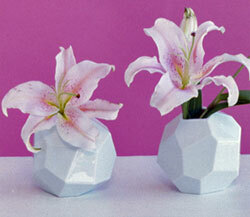 Designed by Koray Ozgen, the vase is sized t just 4 inches x 4 inches and is made of a white ceramic. And with all those sides to stand on, you can angle it in a variety of ways if you want to look a littl quirky.